The relief was carved by Bartolommeo Buon in about 1374-1467) for the tympanum (the space between the lintel and arch) over the principal doorway of the Scuola Vecchia di Santa Maria della Misericordia in Venice. It is described in this position by Sansovino. The sculpture was originally painted and slight traces of blue paint remain in the background. The Virgin once wore a high crown. The motif of the Christ Child in a mandorla on the Virgin's chest is of Byzantine origin and occurs on other works produced in Venice around this date. Some areas are made up in plaster, including the top of the arch above the Virgin's head. The Buon were the most important Venetian sculptors during the first half of the fifteenth century. Bartolommeo inherited the workshop on the death of his father, Giovanni, in about 1443. 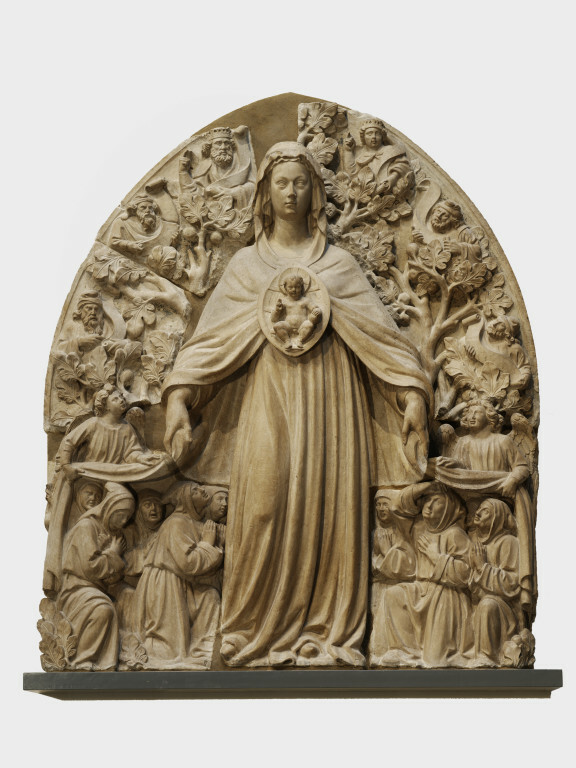 In 1612 the Scuola Vecchia della Misericordia was handed over to the Tessitori di Seta, and the relief was transferred, with other sculptures, to the Fabbrica Nuova della Misericordia, where it remained until the early nineteenth century. 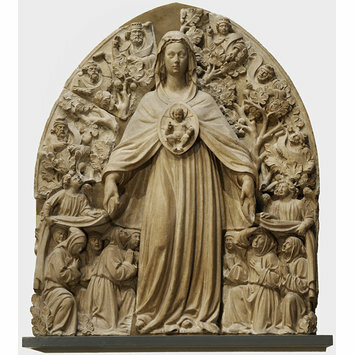 The mandorla (from the Italian word for ‘almond’) was a type of halo that enclosed the entire body. It was usually used to depict moments that transcend time and space, such as Christ enthroned in Heaven in majesty. Here the mandorla forms a morse, or brooch, to clasp the Virgin’s cloak. A Venetian ‘Scuola’, or confraternity, commissioned this sculpture to sit over the entrance to their meeting house. Members of the confraternity shelter under the Virgin’s cloak. Surrounding the Virgin are prophets seated in the Tree of Jesse. They hold scrolls announcing the Coming of Christ, who is shown as a baby on the Virgin’s breast. The pointed arch reflects the Gothic style of the original setting. Bartolomeo Buon was a member of the confraternity and one of the most important sculptors in Renaissance Venice. Arched relief in Istrian stone of the Virgin and Child with kneeling members of the Guild of the Misericordia. 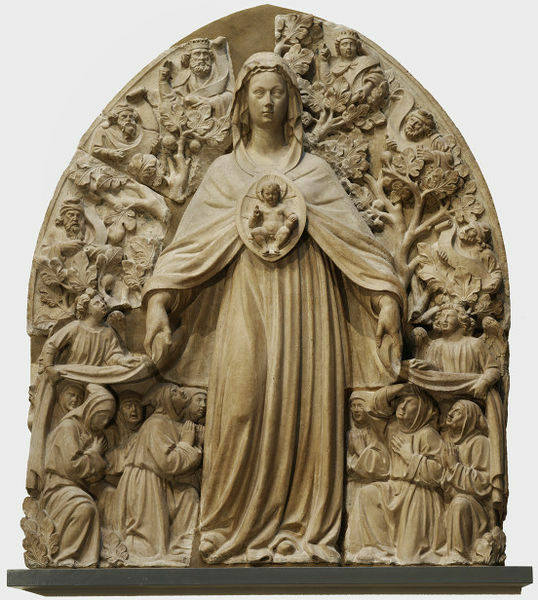 The Virgin, represented standing in full face, wears an ample mantle fastened on her breast by an almond-shaped medallion (mandorla) with a naked figure of the Christ Child blessing. She holds her mantle open with both hands; its extremities are supported by standing angels to right and left. Beneath the cloak are nine kneeling members of the Guild of Santa Maria della Misericordia in attitudes of prayer, four on the right and five on the left. In the branches of the fig tree which forms the background are six busts of kings and prophets holding scrolls. The relief was carved for the tympanum (the space between the lintel and arch) over the principal doorway of the Scuola Vecchia di Santa Maria della Misericordia in Venice. The sculpture was originally painted and slight traces of blue paint remain in the background. The Virgin once wore a high crown. The motif of the Christ Child in a mandorla on the Virgin's chest is of Byzantine origin and occurs on other works produced in Venice around this date. Some areas are made up in plaster, including the top of the arch above the Virgin's head. The Buon were the most important Venetian sculptors during the first half of the fifteenth century. Bartolommeo inherited the workshop on the death of his father, Giovanni, in about 1443.